New Zealand - Mt Manganui, Manganui Beach, the Skyline Rotorua and Luge! 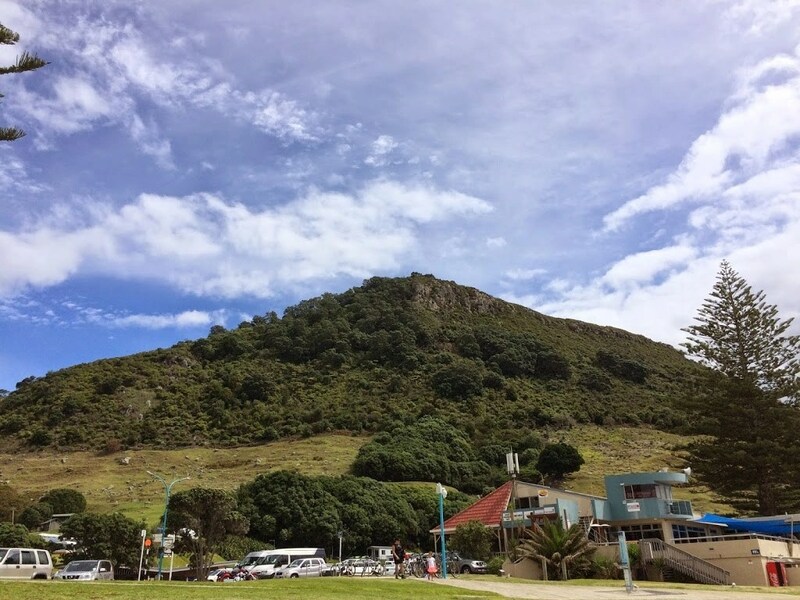 Home > luge • mount Manganui • New Zealand • Rotorua • Tauranga • The North Island > New Zealand – Mt Manganui, Manganui Beach, the Skyline Rotorua and Luge! I’m beginning to think that if there is superhuman: Usain Bolt, Sir Stephen Redgrave and Michael Phelps, then there is super, super human, which I have created especially for Michelle and I. We have taken on every challenge that has been thrown at us on these travels and we haven’t received a single medal! 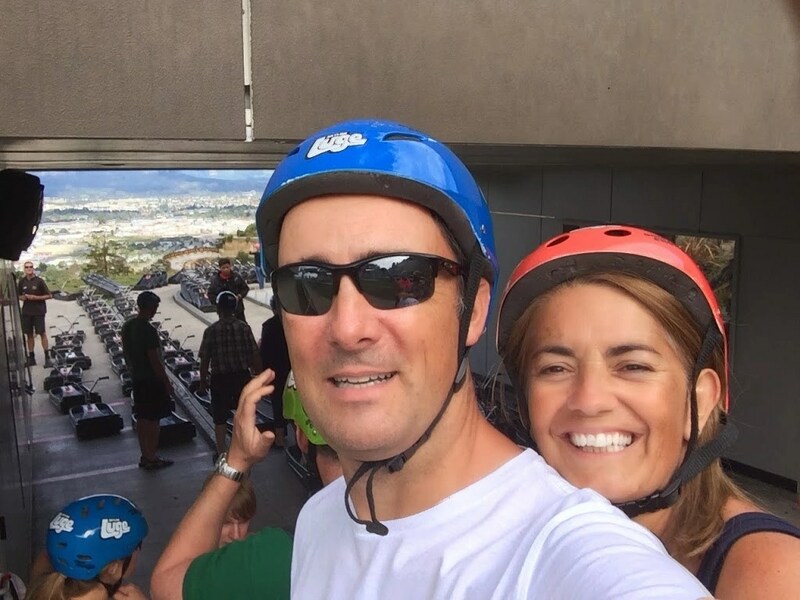 Take today, a steep climb up a mountain, a sharp and difficult descent and then the challenge of the luge. Each day, as super, super human athletes we prepare ourselves for the day ahead. Awake early, we eat Bran Flakes and toast. After no stretching whatsoever, we shower, change and set off on our latest quest. 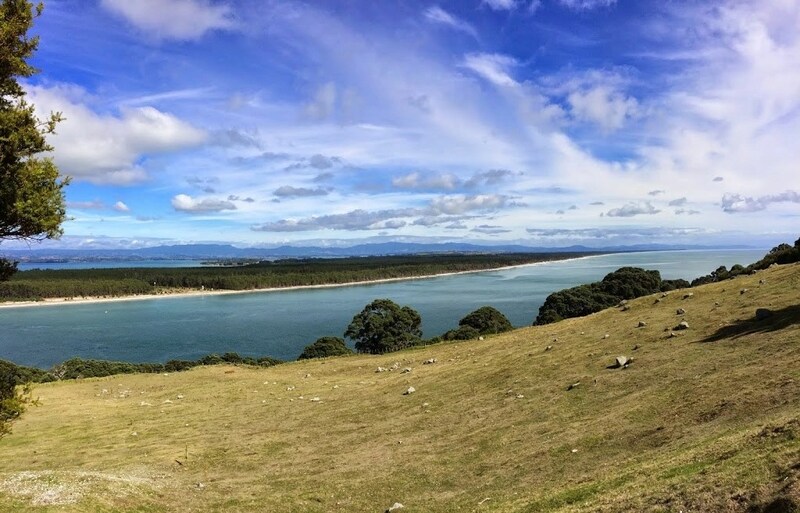 Our thirst for adventure began at Mount Manganui at the very end of Tauranga’s peninsula. Parking at the base of this huge mound we took a few deep breaths and began the hike to the top. Some very self-assured people (cocky bastards) came running past us but we were not deterred. Professionals never break…they just bend a bit. A little Mutley “fasssullrassle” and we strode on stopping only to take a picture of the mouth of the harbour for your delight! Past the gate and up, the gravel path at times needed traversing so that we did not slip. We turned a corner that looked directly out onto the sea and another steep incline faced us. We were now climbers a la Tour de France (the only drug inside us a bottle of Sauvignon Blanc). Doggedly we dug in, passing some ladies that clearly missed their Frosties that morning until we reached the summit where I present to you this magnificent view. Now, super, super human people don’t stop there. Oh no, they carry on looking for the next obstacle. Whilst Bolt, Redgrave and Phelps have all gone home we were still practicing our craft. 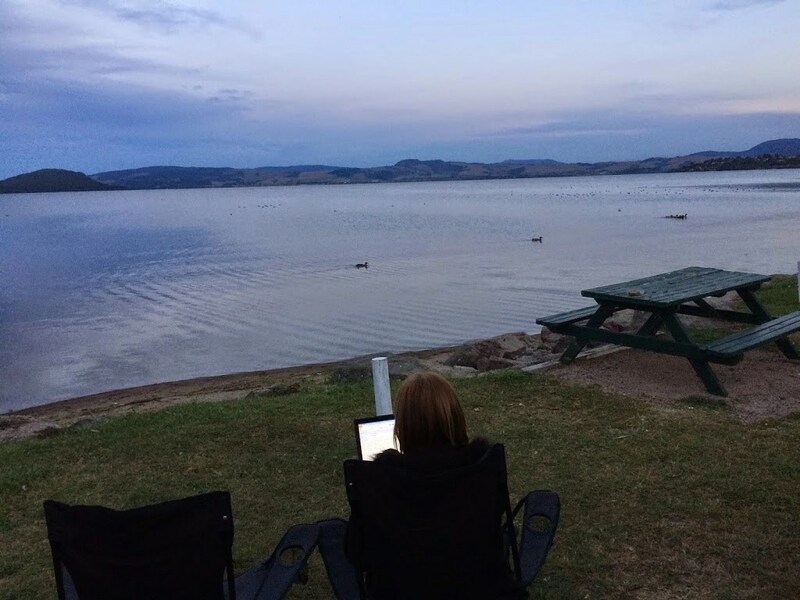 A very healthy lunch was then consumed on Manganui beach purchased from a local Turkish joint – Kebabs r us and we then knew it was time to make our way to Rotorua. Approaching the tourist capital of the north there was a deluge of brown signs pointing to zip wires, sky dives and zorbing but we were going for something way tougher. Harder than 4 WWE wrestlers, luging is one of the few unusual sports in New Zealand. The track we were going to compete on was the first of its kind. Anyone that has seen luging in the Olympics may have an idea of what was in store, except this was different. For a start there was no snow. 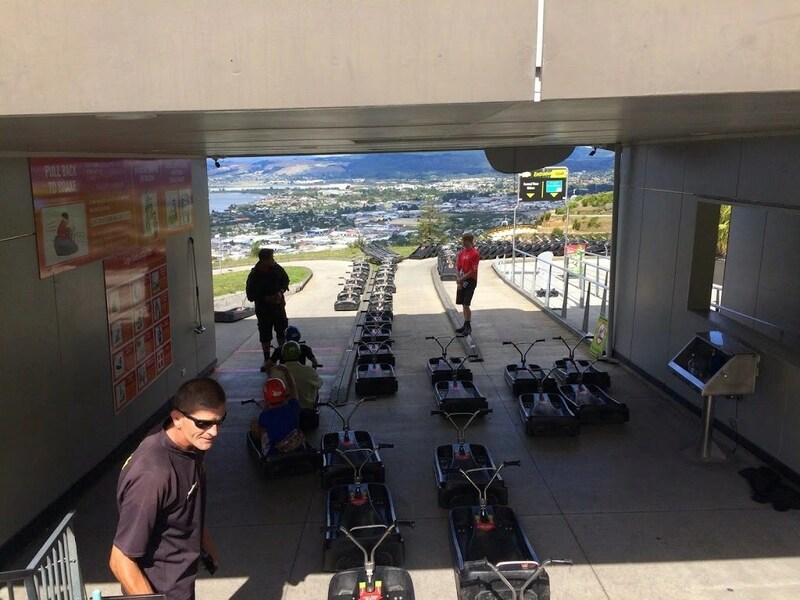 The luge is a small black buggy with wheels at the back and one wheel at the front. To make it go, you simply roll the handlebars forward, to stop you pull back. Sounds simple but trust me, leave it to the professionals. We purchased a trip up the Skyline gondola and 3 rides at a cost of 38 dollars per person and our first run was on the beginner circuit. Just like the luge in the Olympics the course was a downhill one. This was just as well because the luges didn’t have any method of propulsion except for gravity. Even on the beginners course there was a sense of competition and at one point everyone stopped as there was a brief traffic jam of 4 buggies, but after using the tried and trusted method of rocking ourselves back and forth, our tongues hanging out with all the effort, we eventually began to move again. Pah! No longer beginners, we made our way to the intermediate track. There was no stopping on this baby, 2 precipices where the luge almost took off and just like any downhill skier you must control the landing. Now we had qualified for the expert track! More huge humps coupled with tight turns and tunnels. Nothing was too much trouble for the super, super human though and we aced every part of the course with speed and skill, even the last part through a series of undulating curves and plunges over steep track. My reward (an ice cream) was back at the top, which we reached by using a very clever cable car. After each run we were asked to place the buggy onto a conveyer belt and then as each person got onto the cable car a buggy was hooked and carried to the top where it was released for the next person to use. Which flavour did I choose for my ice cream? Do you remember that burger chain called ‘Casey Jones’ which existed about twenty years ago and then vanished without trace? They sold a peach milkshake that was beyond stratospheric, well, my orange and choccy bits ice cream tasted exactly the same! What a great reward for a super, super human! and as we sat and ate our evening bangers and mash (yes, we know how to live) we were joined by a number of birds: seagulls (pesky things) and a number of ducks, one of which was the most audacious bird we have ever encountered. She paraded around us and began pecking our laces and then our legs in a begging frenzy that made Taz, our dog, look like a bystander. We kept laughing as she seemed to go away for a second and then return to see what was next on the menu. While Michelle’s back was turned she went for her cup of tea and then some wine. 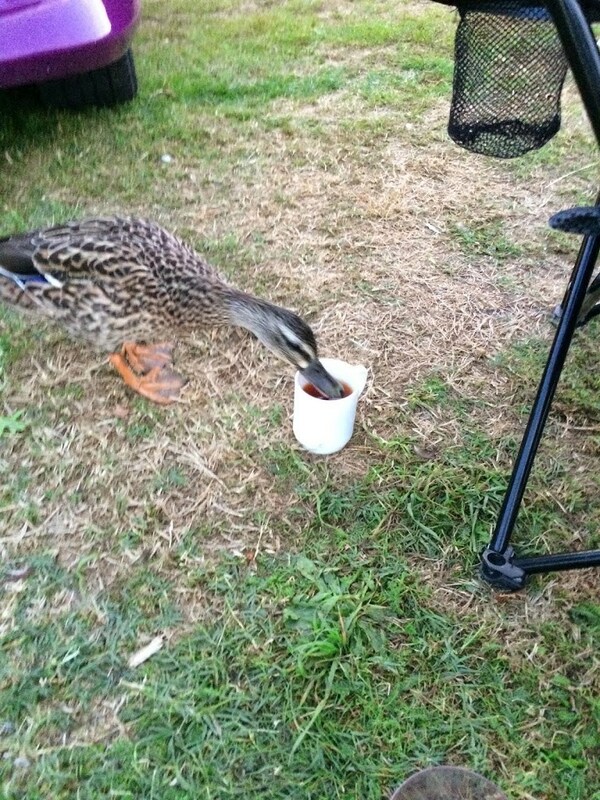 She was a bit quackers, quacking us up with her attempts for food. 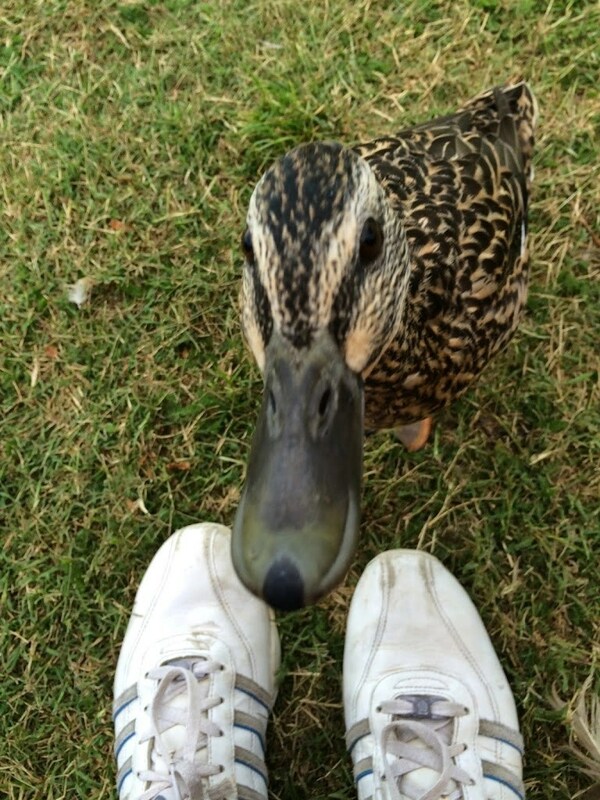 I think she thought she had quacked it when she met us. We named her Bertha and when I went to stroke her she bit my hand. Some things you cannot buy!